Author: Mochammad Faisal Karim, Bina Nusantara UniversityThe recent crackdown on peaceful protesters by the Egyptian military, which killed more than six hundred people, has sparked international outrage. But despite the magnitude of the violence, one in a series of bloody events in Egypt’s journey toward a stable democracy, Indonesia’s participation in the events — and indeed its support for the civilian government — remains relatively low key. 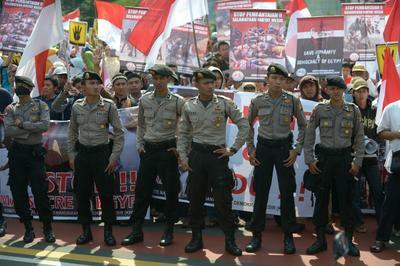 Even prior to the recent crackdown, Indonesia did not show a firm stance against the coup perpetrated by the Egyptian military. As the third-largest democracy and the most populous Muslim country in the world, Indonesia should take a greater role in shaping and consolidating democracy in Egypt. But given the centrality of ASEAN and its principle of non-interference in Indonesia’s foreign policy, Indonesia has been reluctant to pursue its role as a stable Muslim democratic country. Despite these hurdles, Indonesia should have a greater role in resolving the turmoil in Egypt. First, Indonesia has a moral obligation to support Egypt’s transition toward a stable democracy, given that the promotion of democracy and democratic values are a key characteristic of Indonesia’s foreign policy. Since 2008, Indonesia has directed its effort to become the leader and promoter of democracy in Asia. Some writers even further argue that democracy is projected to be Indonesia’s new international identity. Indonesia initiated the Bali Democracy Forum (BDF) in 2008 as a forum to promote and develop democracy in the Asia Pacific. Along with the BDF, Indonesia also established the Institute for Peace and Democracy, a state-sponsored think tank to promote Indonesia’s democracy experience abroad. Second, Indonesia is one of the few countries that can keep its military in check in the post-authoritarian era — the Indonesian government has been successful in keeping its military out of the political realm. Like Egypt, Indonesia went through a similar process of reforms and political transformation back in 1998, which, as President Susilo Bambang Yudhoyono noted, Indonesia safely navigated with the cooperation and collaboration between civilians and the military. Indonesia should draw from this experience to take action against any coups that attempt to harm a country’s democratic transition to civilian control anywhere in the world. Third, Indonesia’s domestic audience wants Indonesia to have a more active role in supporting legitimate civilian control in Egypt’s democratic transition. While many domestic factors such as internal security in Aceh and several ethnic conflicts in the past may have prevented Indonesia from taking a greater role in international issues, the events occurring in Egypt have sparked concern among Indonesians. Nahdlatul Ulama and Muhammadiyah, Indonesia’s two largest Islamic organisations, have condemned the atrocities carried out by the Egyptian military. Thousands of Indonesians have demonstrated against the Egyptian military’s brutality toward its own people and asked that the Indonesian government play a greater role in Cairo. Even members of parliament have urged the Indonesian government to take stronger action — they requested that the Indonesian ambassador to Egypt be recalled as an act of protest. The Indonesian government, in taking a firm stance to support civilian control in Egypt’s democratic process, will meet the expectation of the majority of Indonesians. Fourth, Indonesia can use its active participation in Egypt’s democratic transition to improve its influence and standing on the world stage. Indonesia could be a pivotal partner for the United States in promoting good governance and democracy throughout the developing world, especially in the Muslim world where the US has failed to do so. The events in Egypt might be a chance for Indonesia to show that it is concerned for the enforcement of democratic and human rights in all regions of the world. Finally, given the silence of the Arab League and Gulf states, as well as the failure by EU diplomats to mediate between the pro-Morsi group and the military-backed temporary government, Indonesia may have a chance to be a genuine mediator between the two groups to stop further bloodshed. To support its mediating role, Indonesia should use all diplomatic resources at its disposal, such as its position in the UN and its role in the Organisation of the Islamic Conference. At the end of the day, foreign policy begins at home. Jakarta may see itself as a solely regional power in Southeast Asia. But this cannot be further from the truth. Indonesia has the opportunity to play a greater role outside the region, beginning with Egypt, and has the chance to become a global leader in promoting democracy. Mochammad Faisal Karim is a Lecturer at the Department of International Relations, Bina Nusantara University. Taiwan Representative Chang Liang-Jen: "There Are Still Some Rooms for Improvement in Indonesia–Taiwan Relations"